A new interview out of August's Gamescom event in Germany was released earlier this week by Shenmue 500K, covering Shenmue III and other topics. The interview was conducted by Sílvia Vila Tarrés and James Hamill, interviewing Shenmue III's director Yu Suzuki together with the game's executive producer Hideaki Morishita. How far the Shenmue prototype for the Saturn had progressed? ("Thirty percent"). An amusing windsurfing anecdote recounted by Yu, from the time of Shenmue I & II's development, featuring composer Takenobu Mitsuyoshi. On a personal note, it was my pleasure to help out on this interview by providing a translated transcription of Yu's responses from the audio recording (since taking video footage of the interview was not permitted). What made an impression on me from the audio recording is the enthusiasm and humor that carried across in his voice, despite this being one of many scheduled meetings and interviews during the event. Both Yu and executive producer Morishita-san also took great care in answering the questions, clarifying their meaning with the interviewer when needed, really reflecting their respect for the fan community. The interview has been written up in a friendly, narrative style making the article a pleasure to read - and the photographs and animated pictures liven it up even further. The questions are also varied and feel fresh, branching outside the ones Yu was most commonly asked about by the general media at the event. 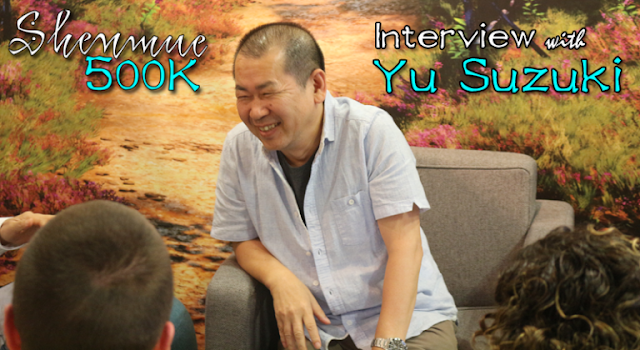 Head over now to the new Shenmue 500K website to read the interview here.